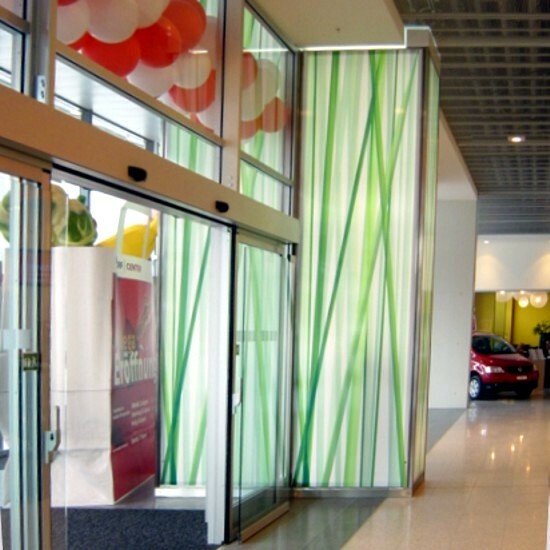 A successful partnership is based on trust, reliability and quality. 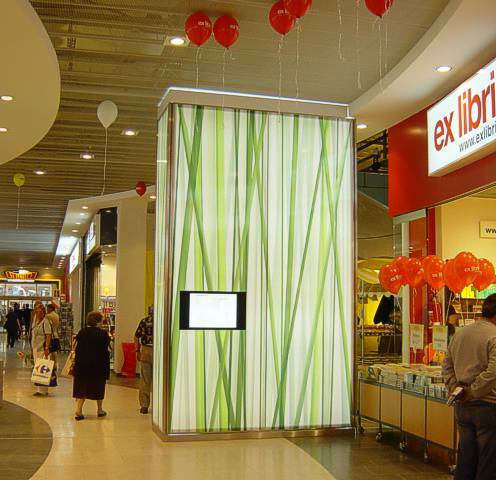 Teamplay is the most important requirement for successful project with which both parties are satisfied, especially in large-scale project and long-term partnerships. 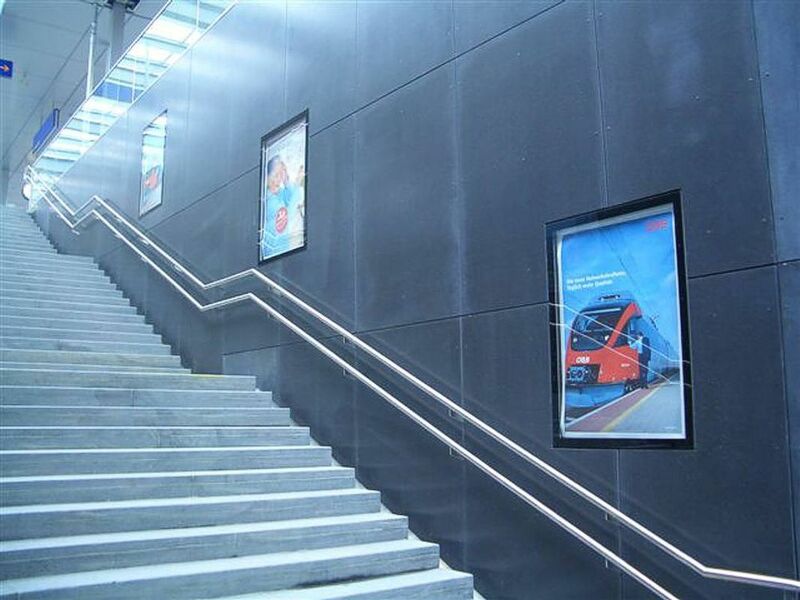 We are satisfied with our successful cooperation with our customers. 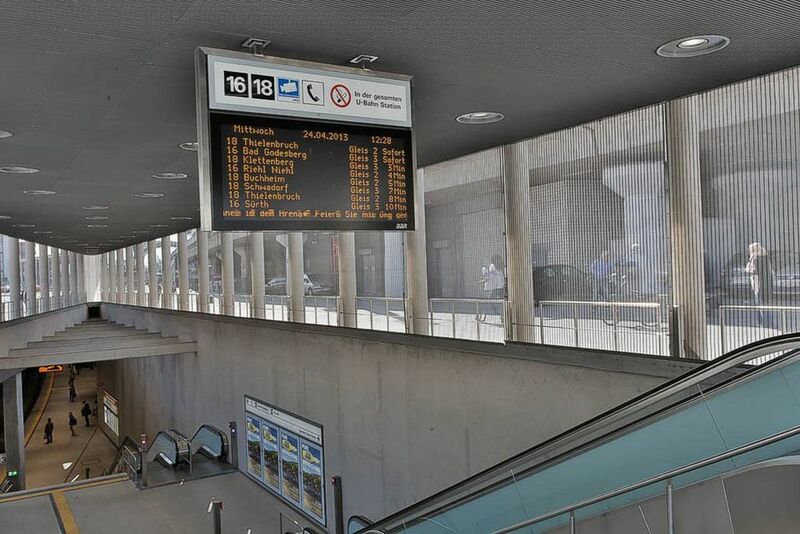 We would like to thank you for the successful cooperation. 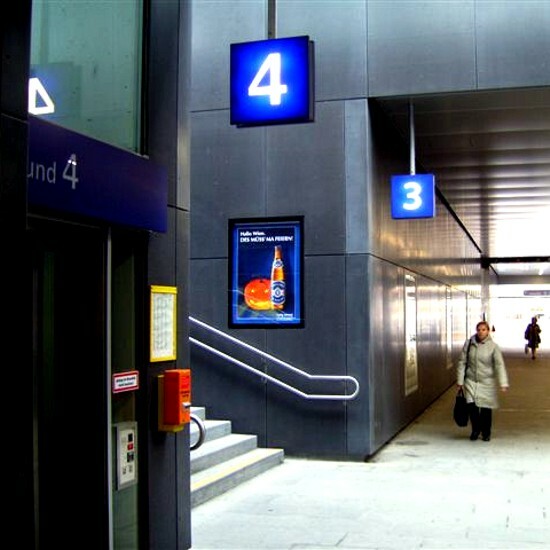 The Speicherstadt is a unique example for he refurbishment and conversion of a former „Army Maintainment Headquarters“ into a modern office and communications center in the north of Münster. 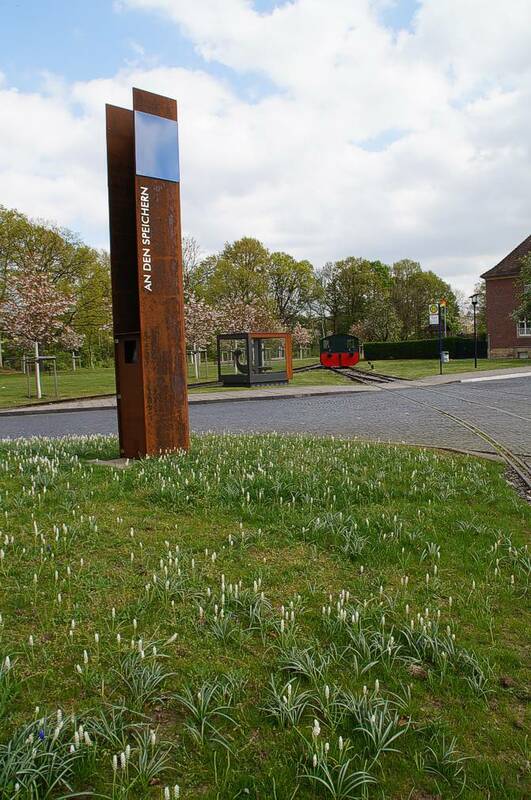 Recently, the oudoor facilities were opened in an architecture that used a series of corten steel elements. 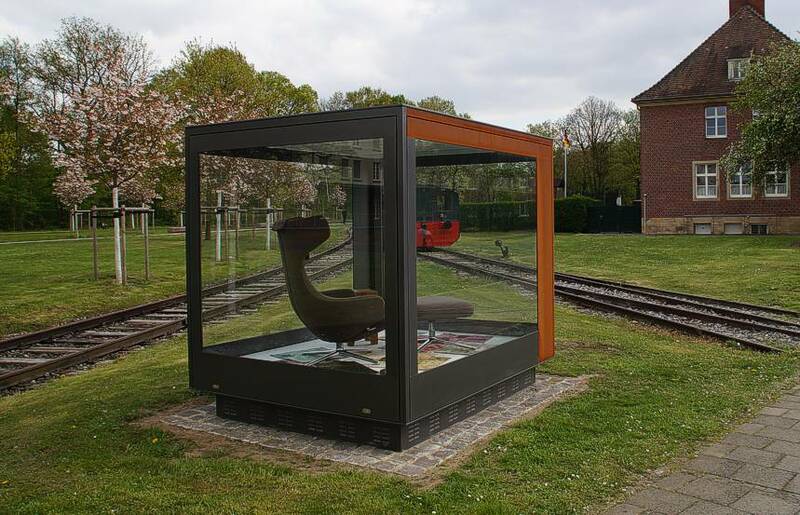 ST-VITRINEN set a building highlight in the outdoor area of the Speicherstadt with a large boulevard showcase that is made of corten steel and coated aluminum. 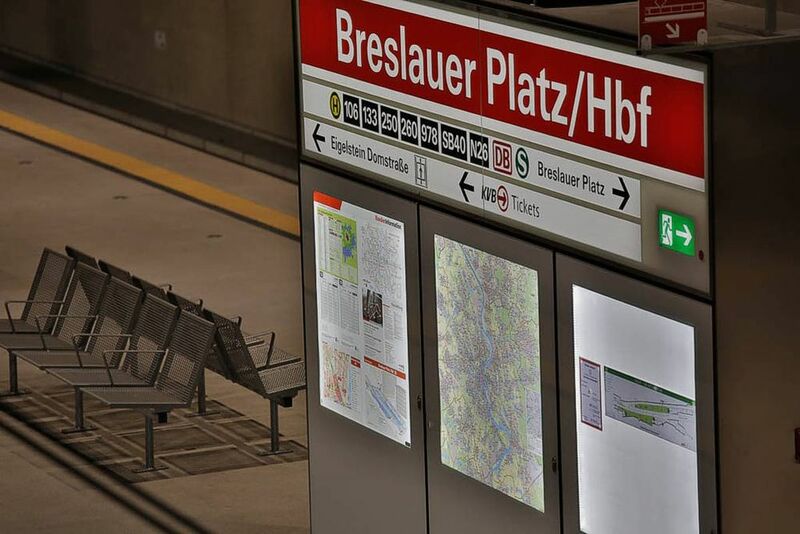 The Breslauer Platz in Cologne is located on the north-east side of Cologne’s main railway station. 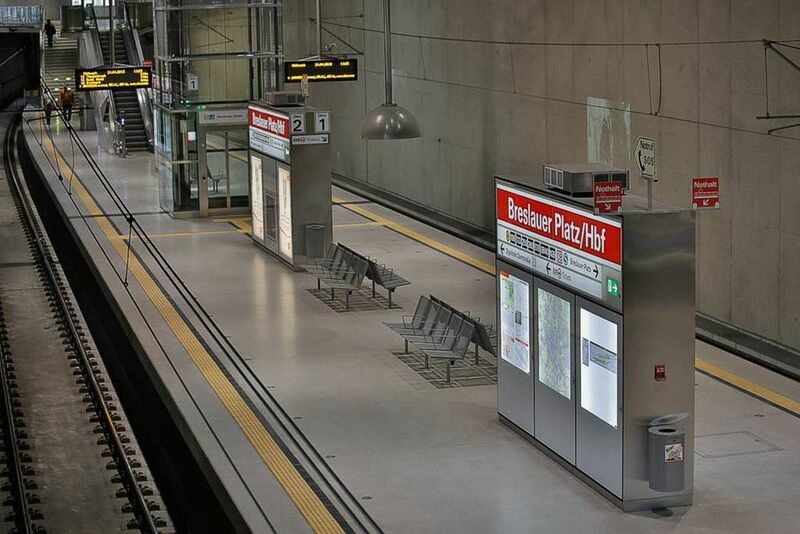 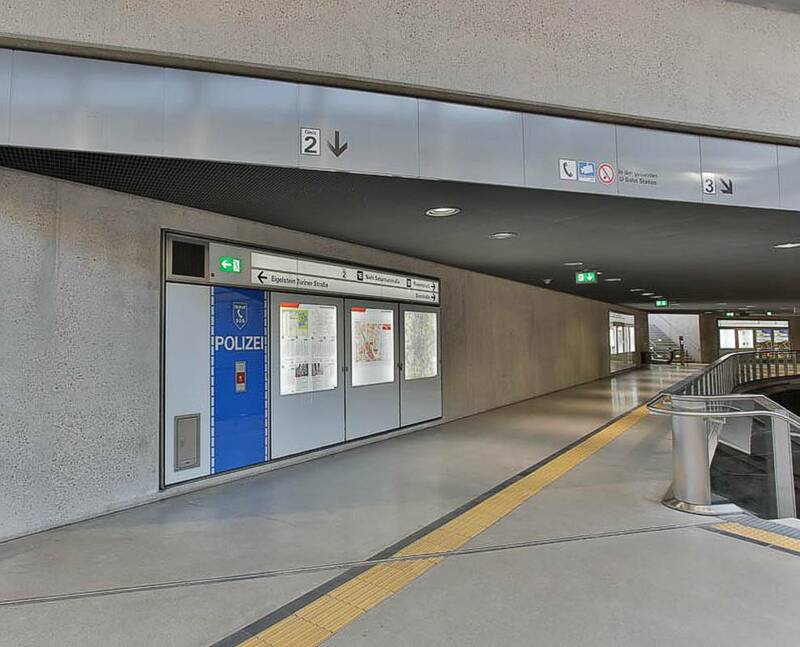 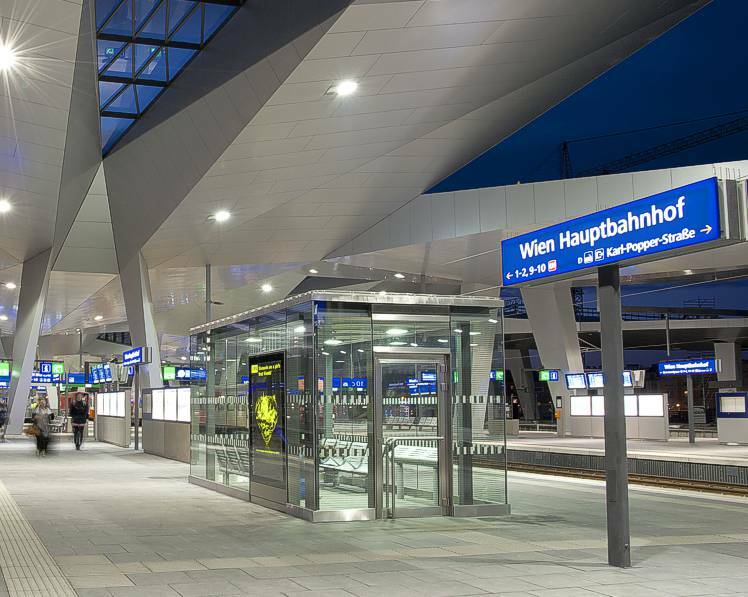 The subway station was designed by the architectural office BDA Büder + Menzel. 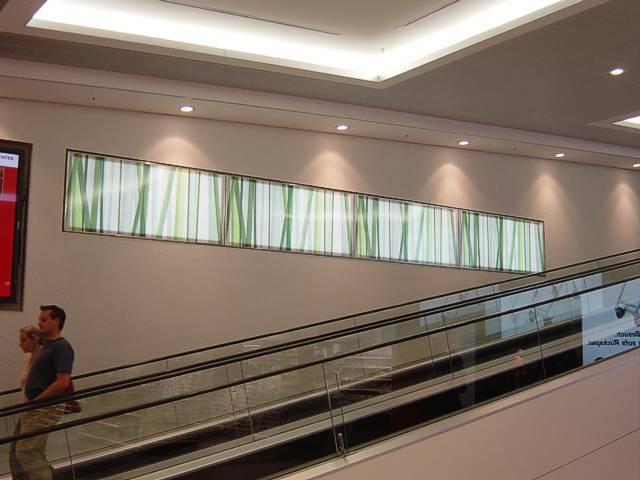 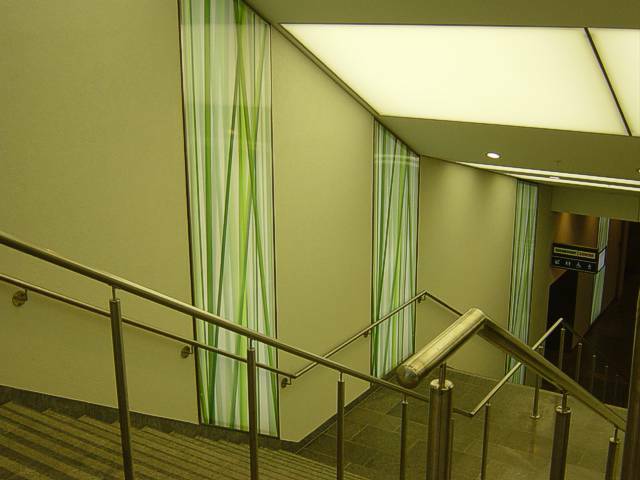 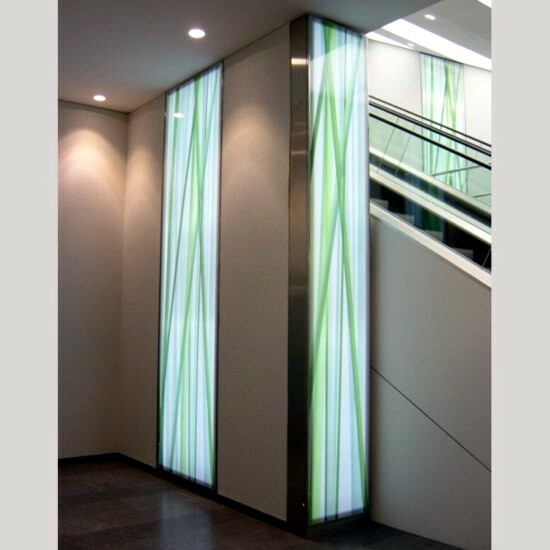 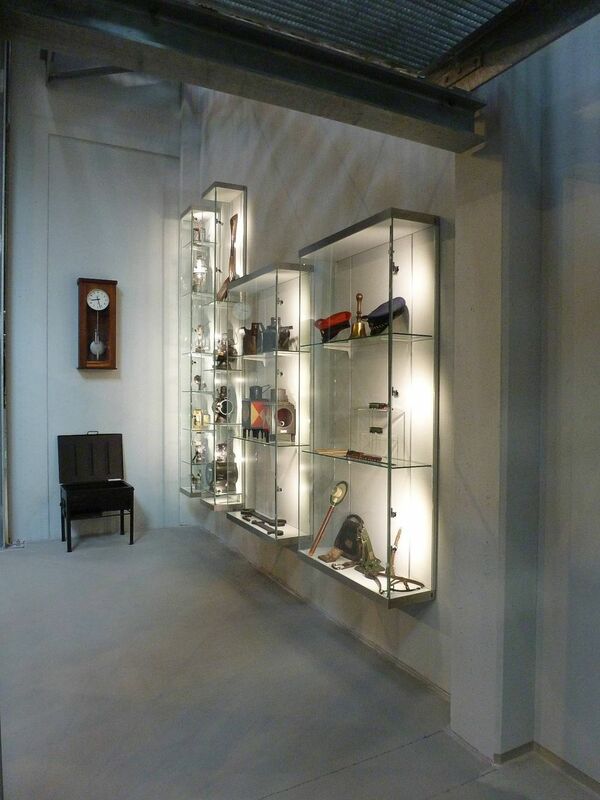 The clear architectural design of the all-glass showcase VITRUM ® that is installed into a wall is impressive. 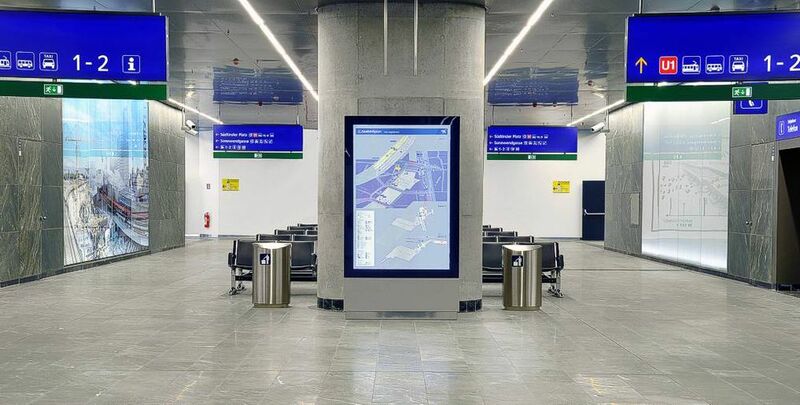 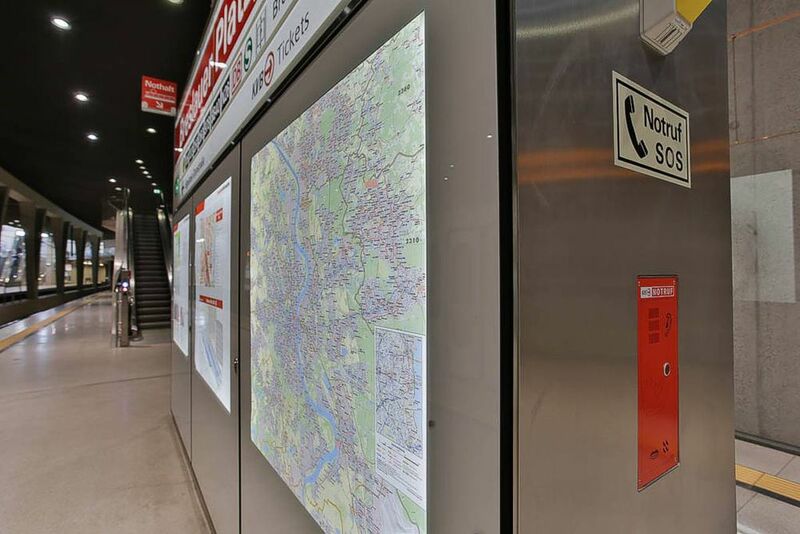 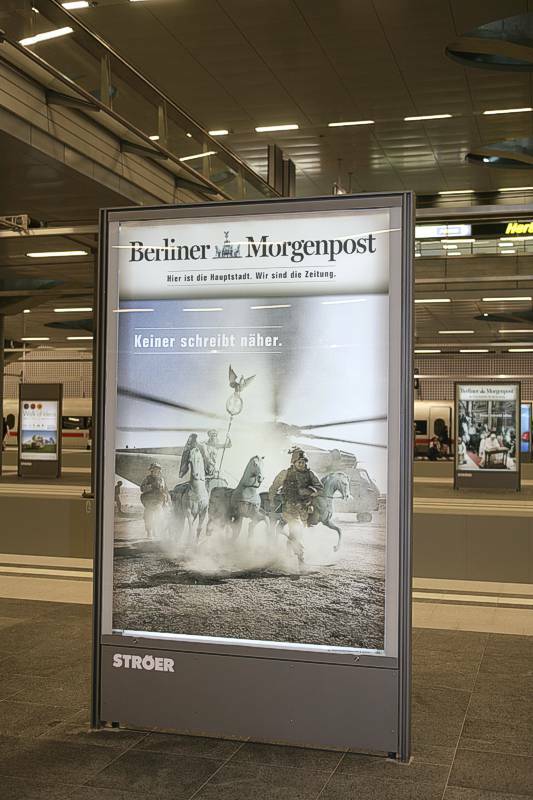 All showcases and signposts are backlit with special light-optimized LED light panels which bring enormous energy savings and a great reduction of the CO₂ emission. 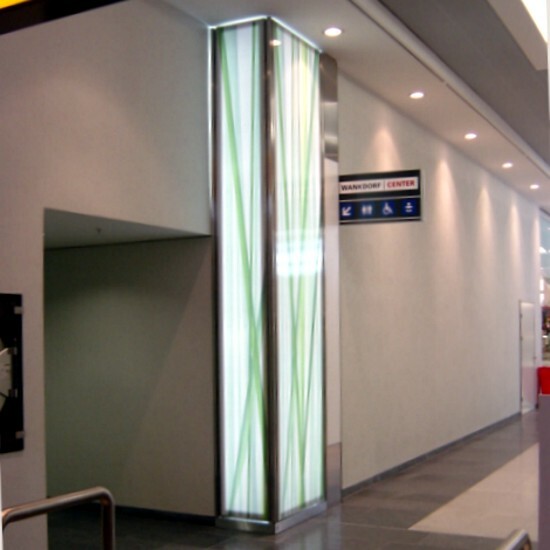 The integration of individual media like a police emergency call, flashing light, a ticket machine, a fire extinguisher, a Kemper safe, emergency exit light and a service telephone in their respective glass fronts show new architectural possibilities in the design of media showcases. 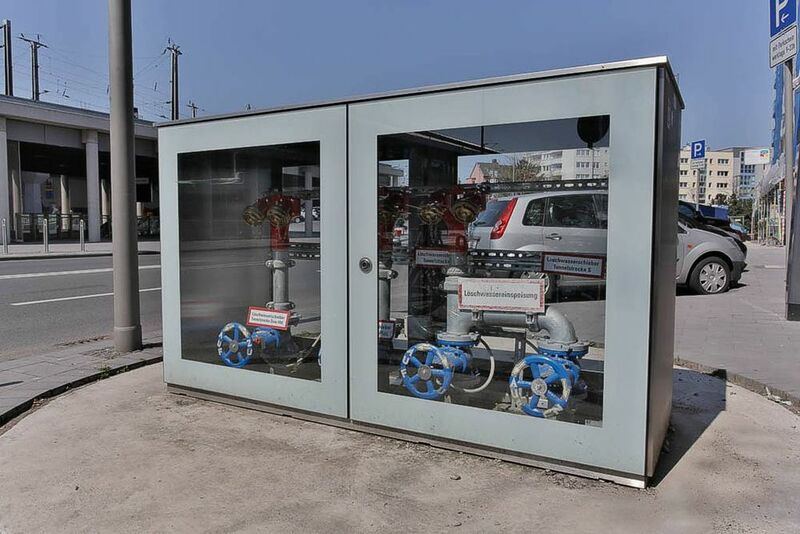 The ST-VITRINEN system used have the fire protection certificate 13-5005 B and are therefore extremely safe against fire. 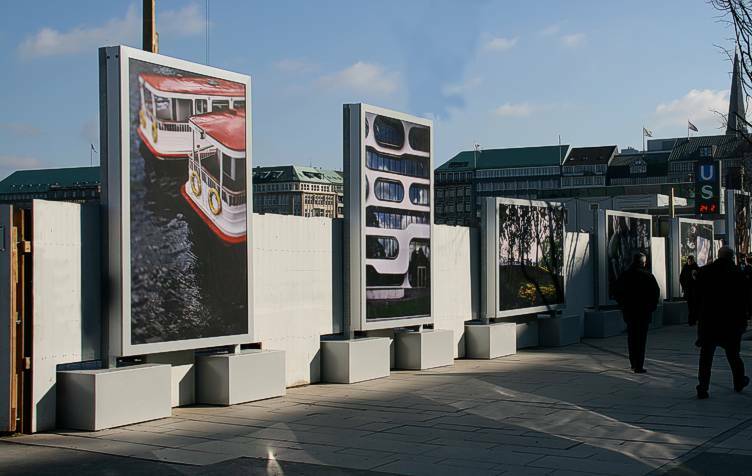 A very special “construction fence” is at the Hamburg Jungfernstieg and is conceales together with oversized poster showcases the view of the rather bad-looking construction site. 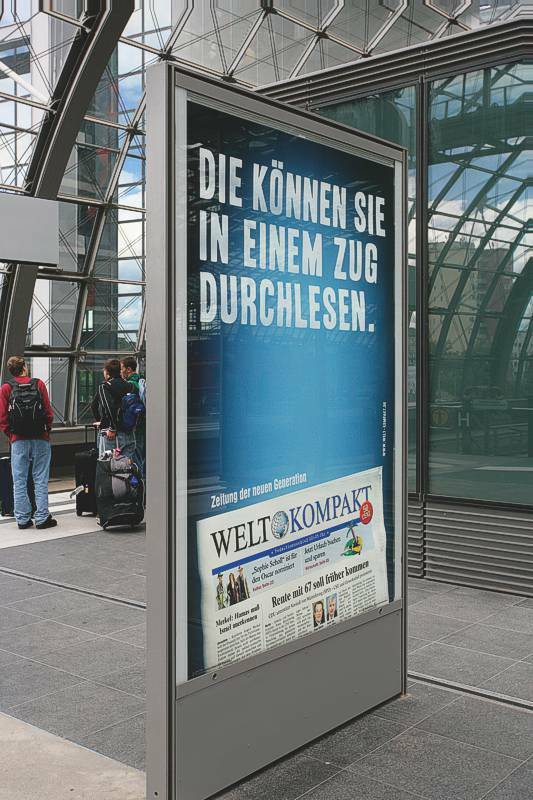 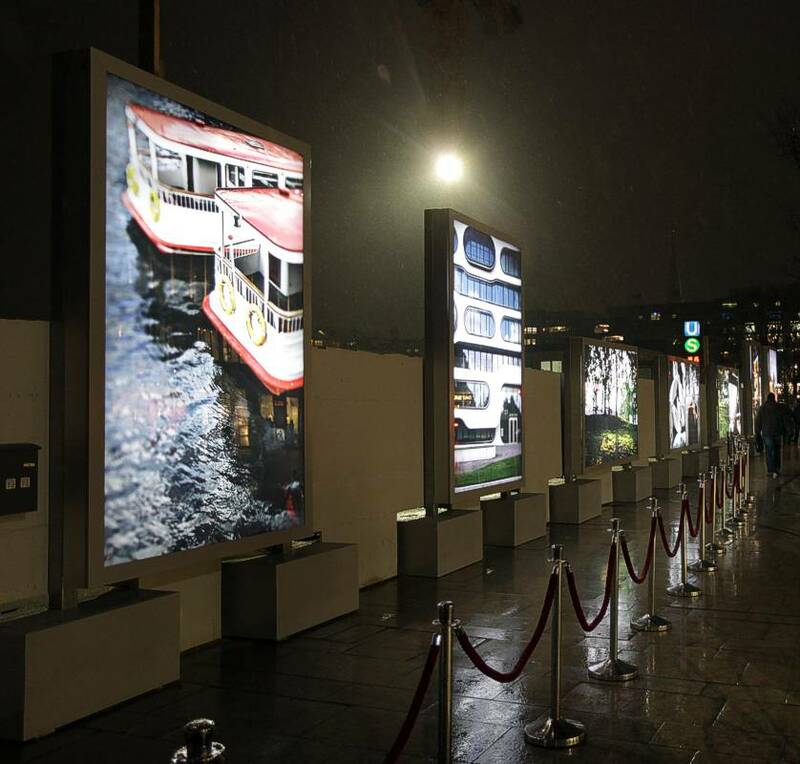 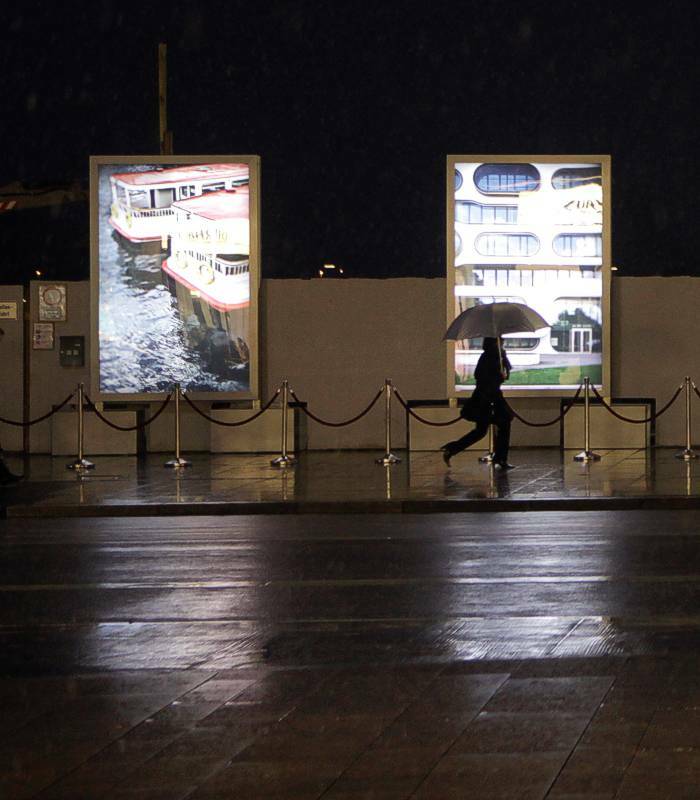 The poster areas in portrait and landscape format are equipped with motives from and around Hamburg that are fully illuminated at night. 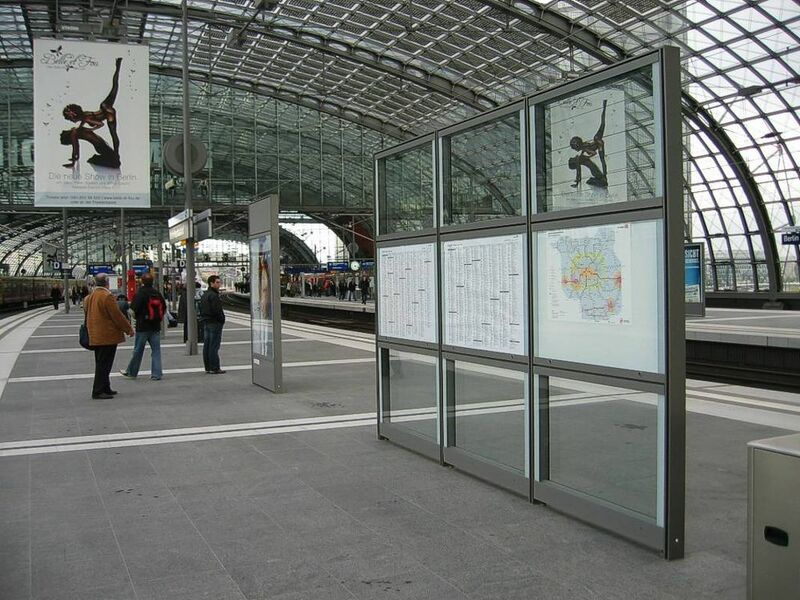 This makes Hamburgs “construction fence” the best-looking in the world – made in Bielefeld! 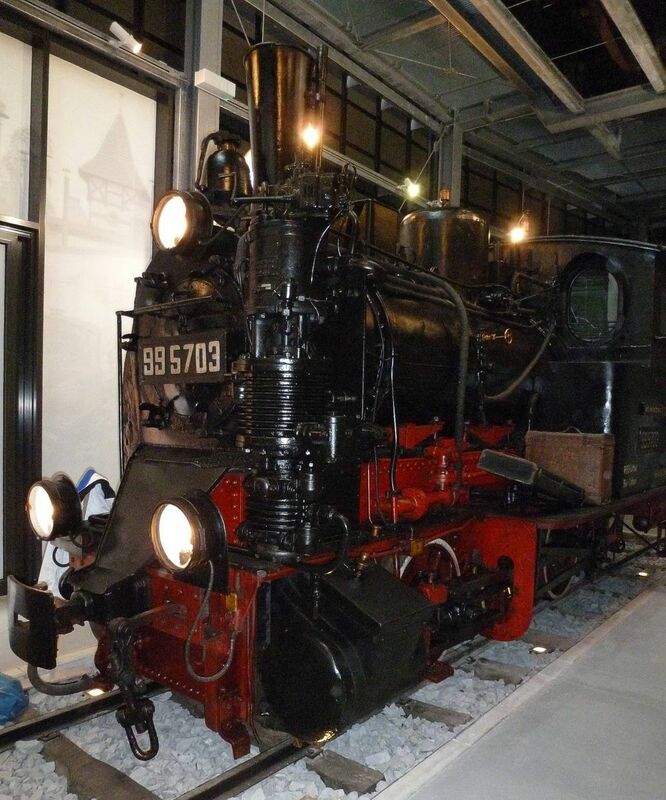 The Spreewaldbahn ran from 1898 to 1970. 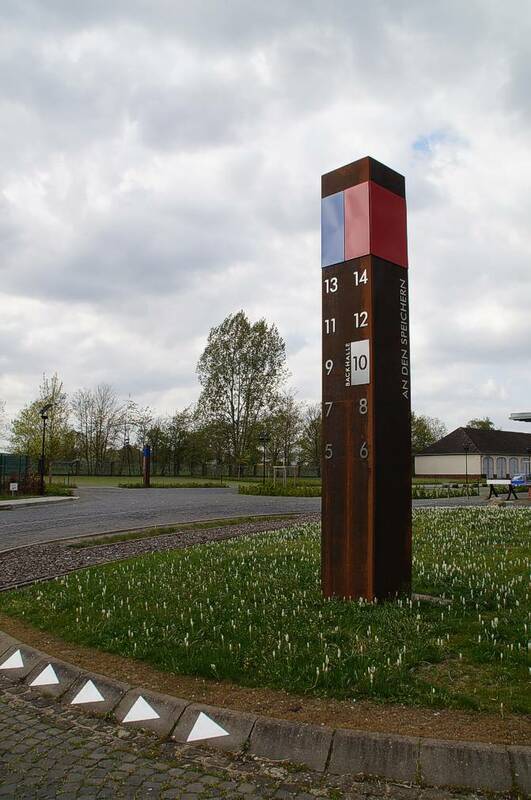 It started in Straupitz and took its route to Lübben, Goyatz, Lieberose and Cottbus. 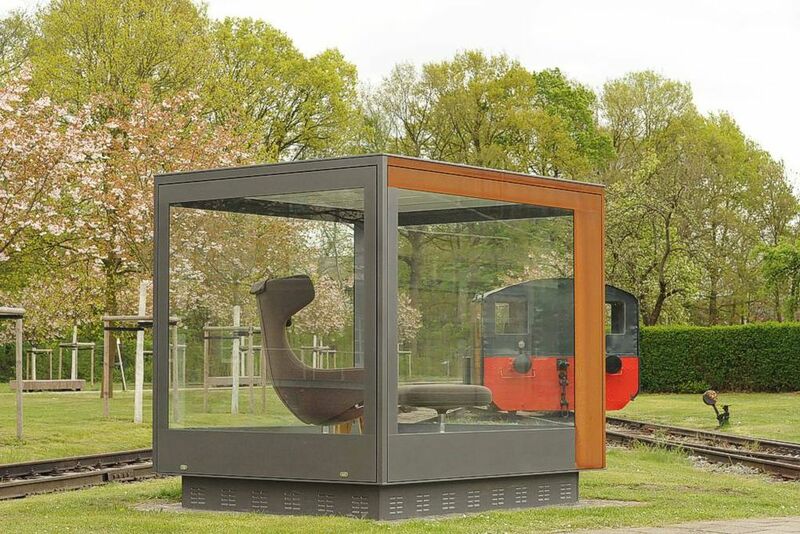 At that time, the railway was very valuable for the region as it linked cities and villages in the Spreewald, bringing people together. 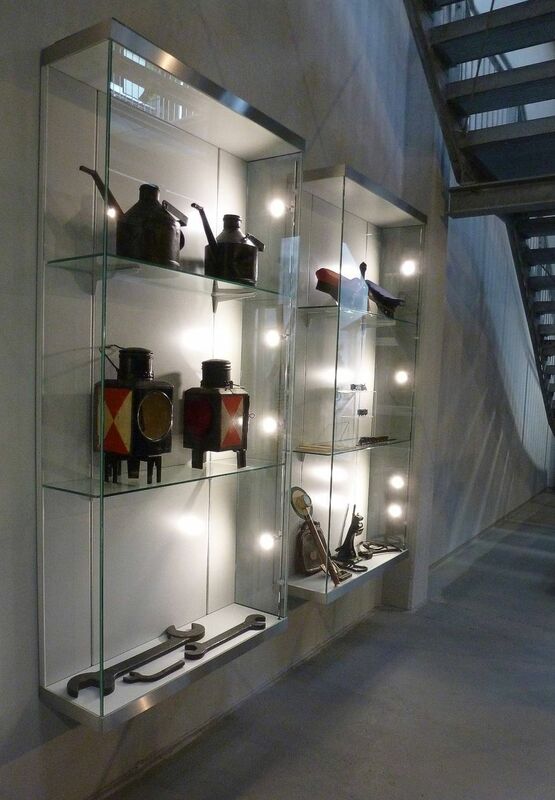 Our museum showcases give an impression of showing the daily craftwork of the train in the Spreewald. 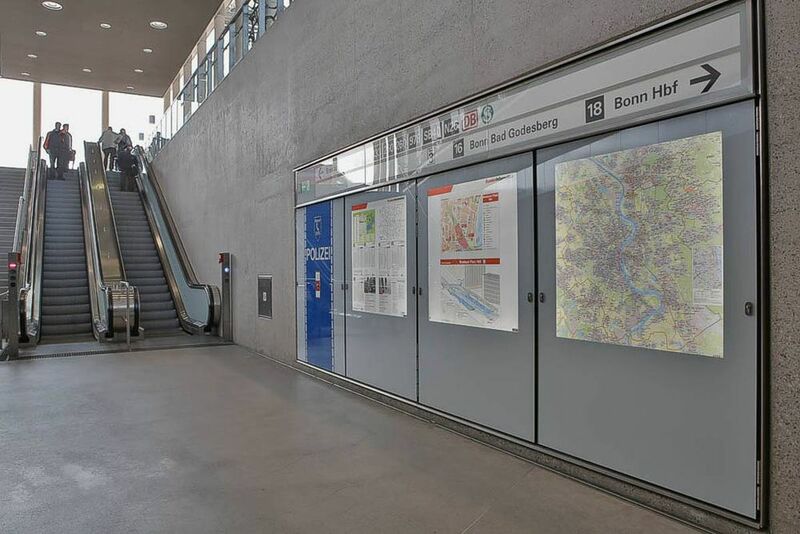 Berlin’s main railway station is he most important railway junction in Berlin and is also Europe’s largest tower station.t The central station is also the regional railway station and has direct connections to the S-Bahn network. 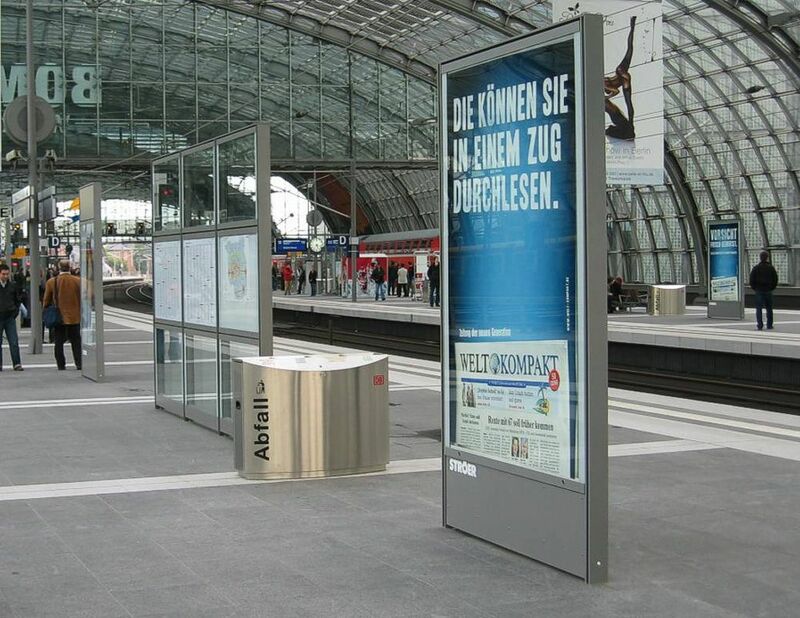 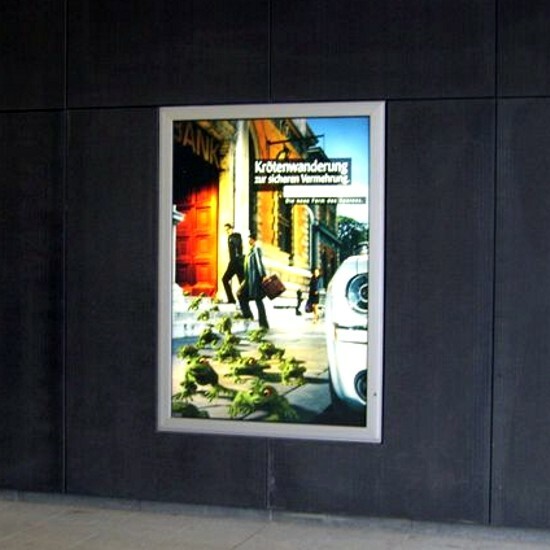 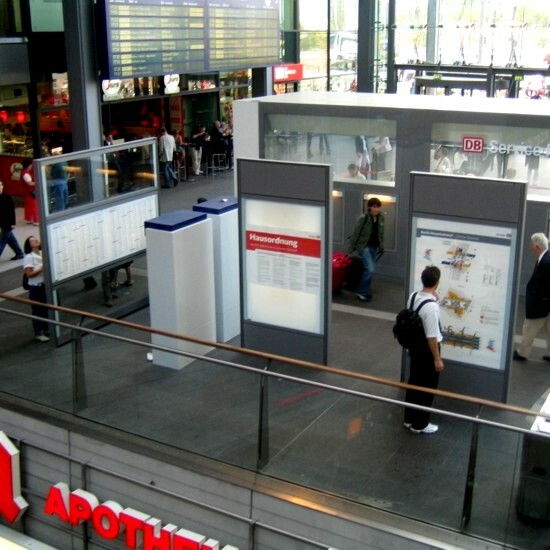 Numerous of our information and advertising displays were placed in the GMP design. 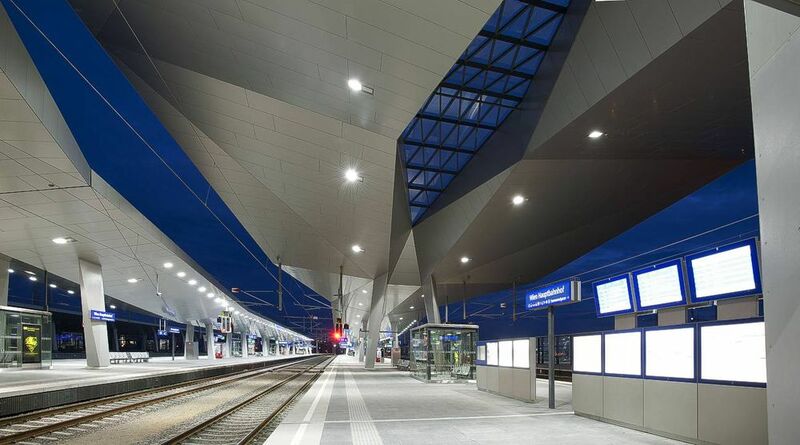 The sensational architecture of the main station is determined by brightness, friendliness and comfort. 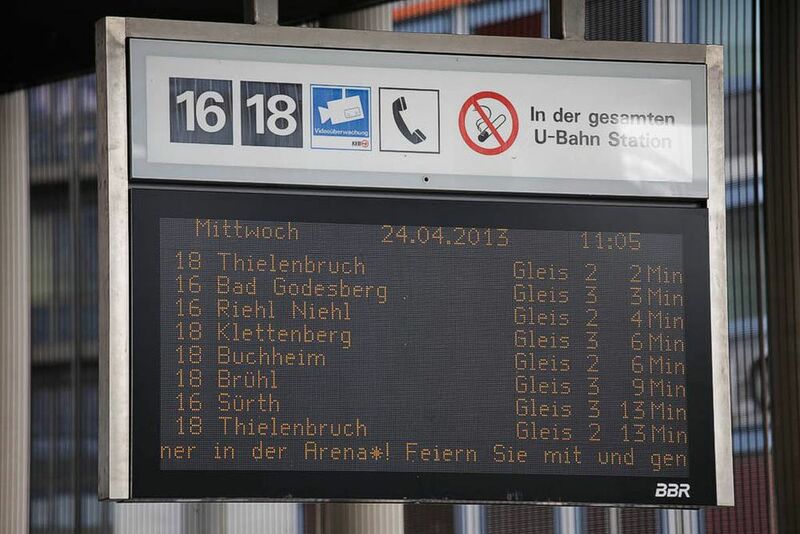 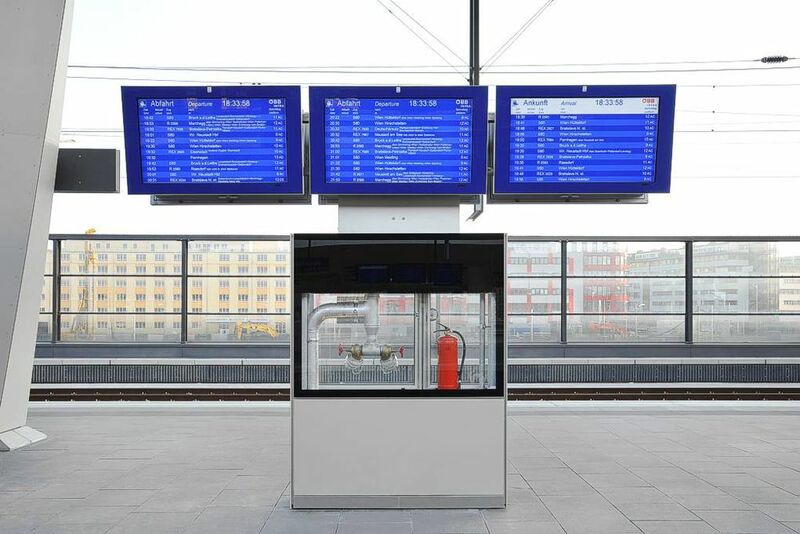 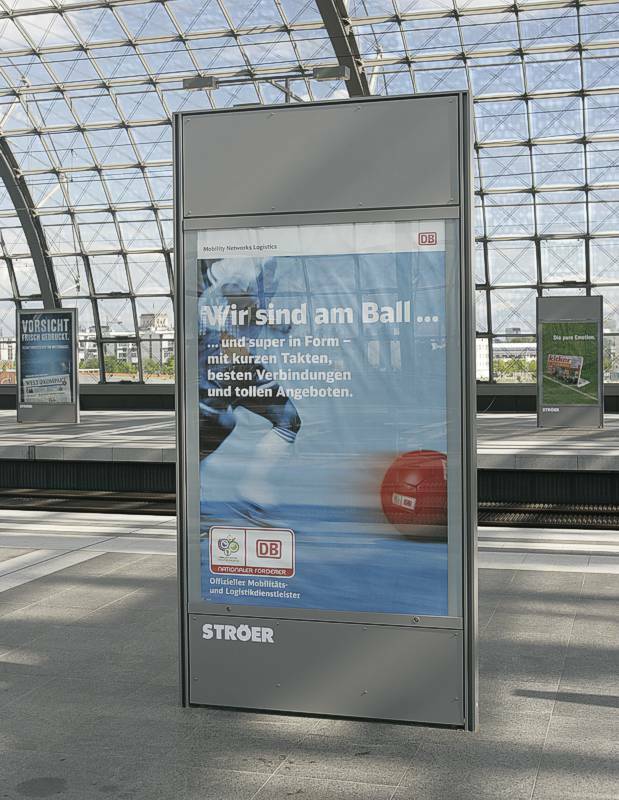 Modern ST-timetables and monitor showcases support the implementation of a barrier-free infrastructure. 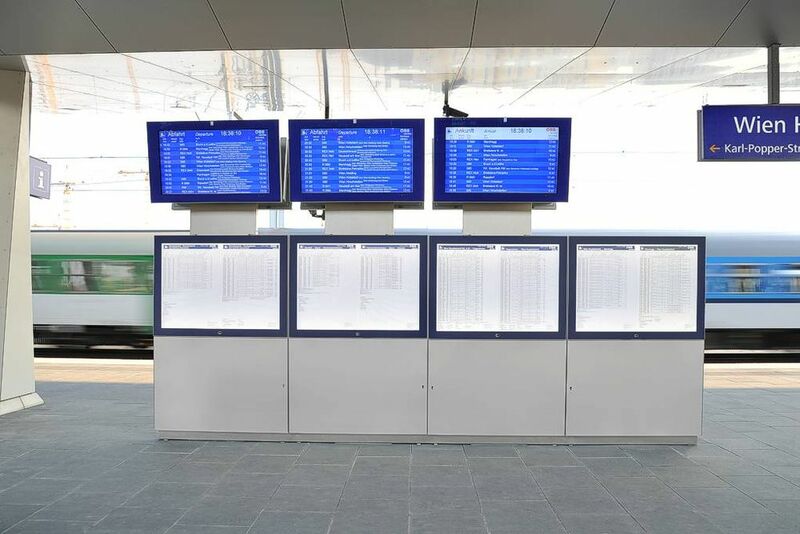 ST-timetable showcases are backlit with LED-light panels with a power consumption of only 38 watts per DIN a 0 area (1189 x 841). 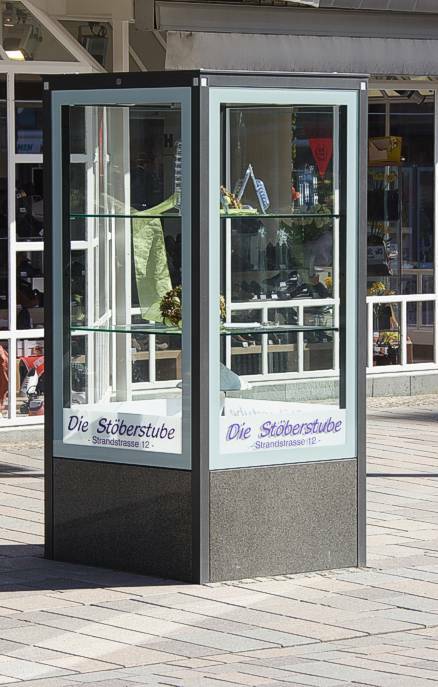 The CO² load per DIN a 0 area is reduced by approx. 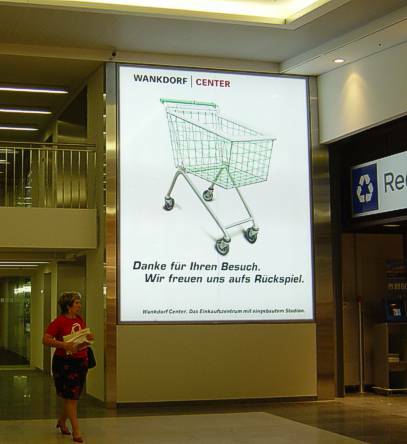 511 kg / year, compared to a backlit surface with fluorescent tubes. 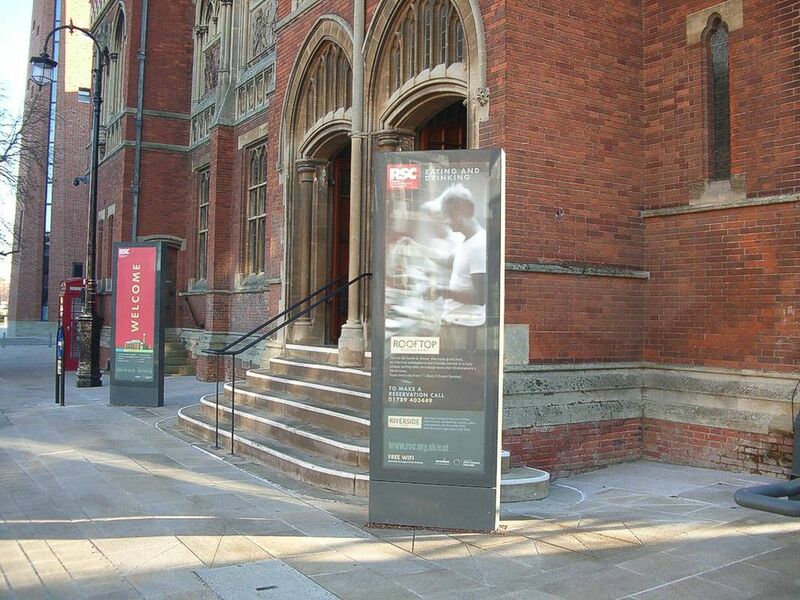 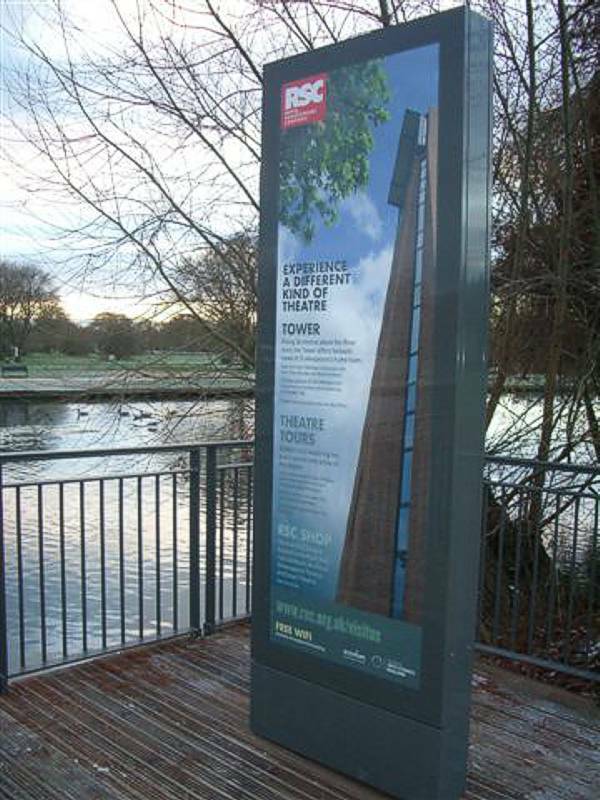 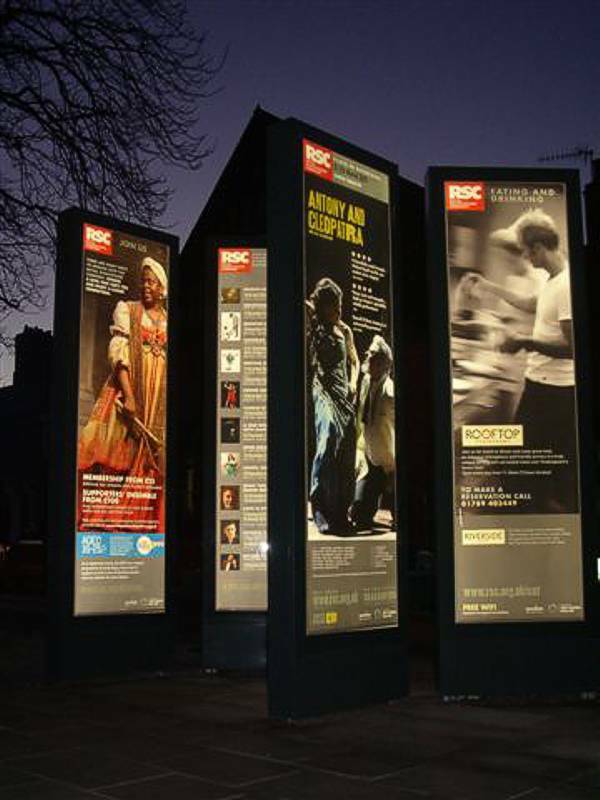 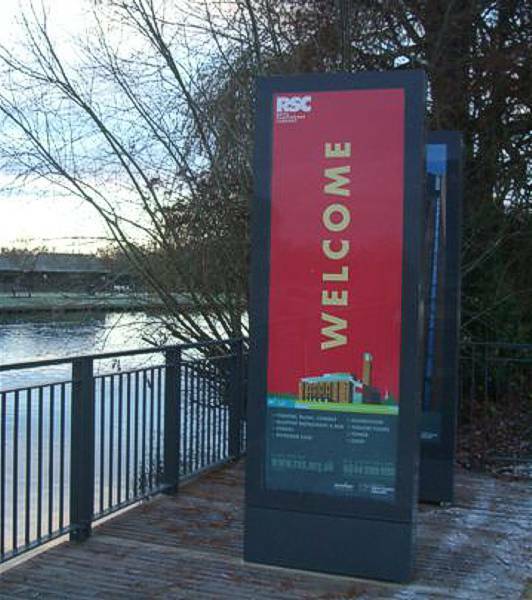 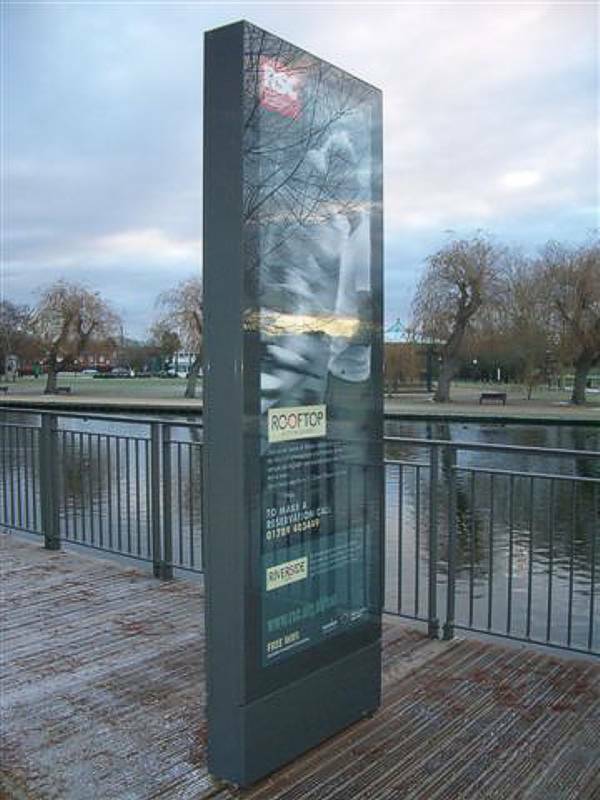 A total of 11 totems were developed and designed for the Royal Shakespeare Company. 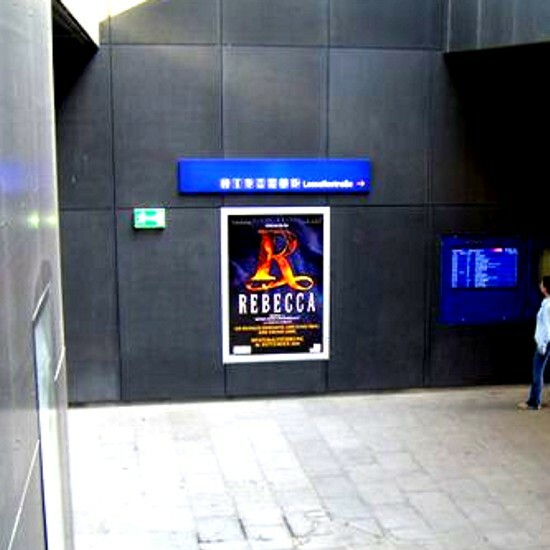 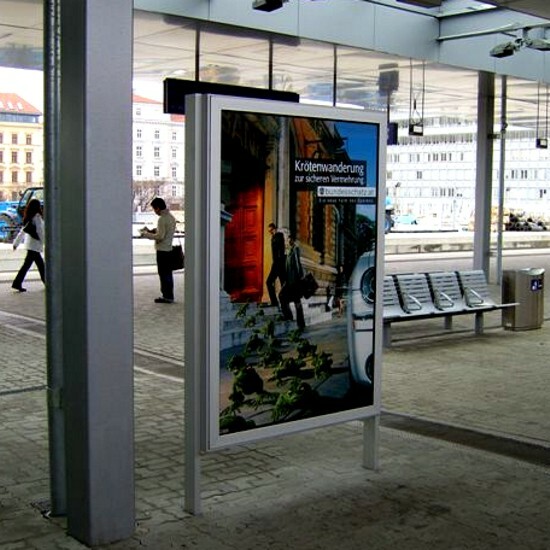 The poster showcases in the VITRUM-design are there to attract people to the theater grounds. 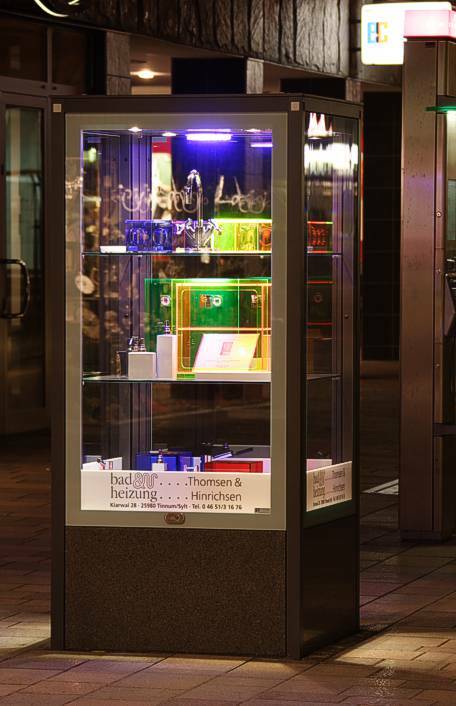 In addition to the height of the showcases of up to 3 meters, the solution is characterized by an extremely brilliant and energy-efficient backlighting with LED technology that is especially effective at night. 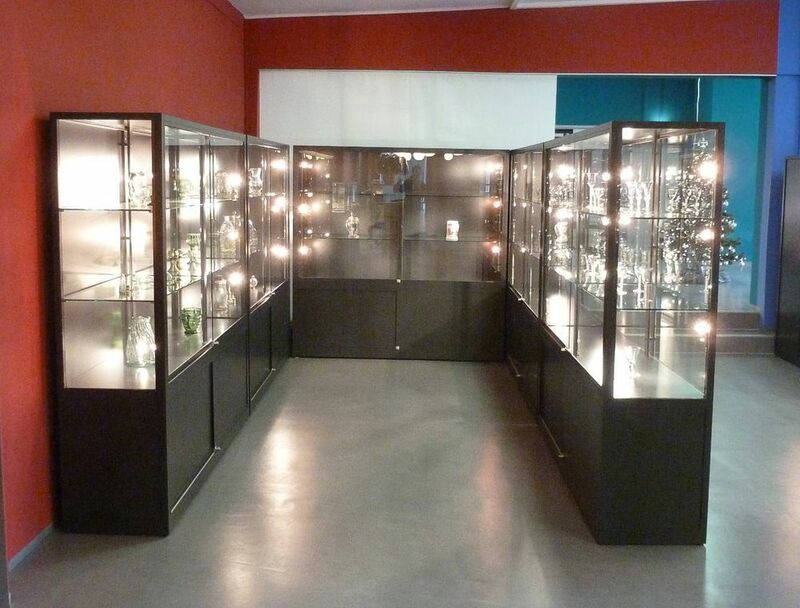 We have supplied the new glass museum in Lauscha with our showcases. 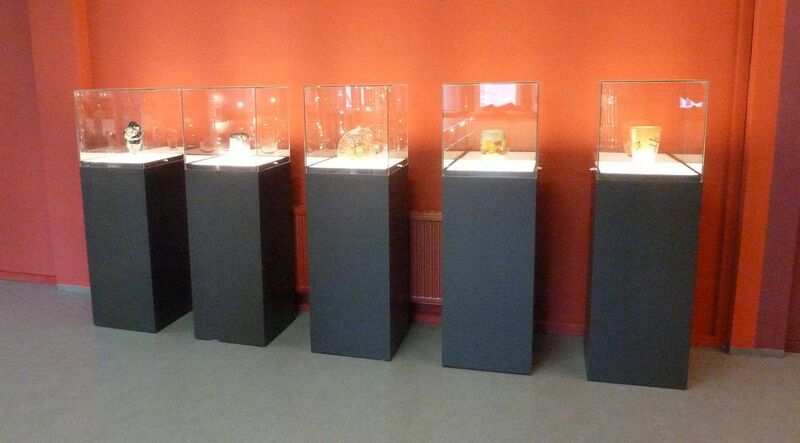 The most precious objects of the traditional glass-work of the Glasbläserstadt Lauscha in Thuringia can be visited. 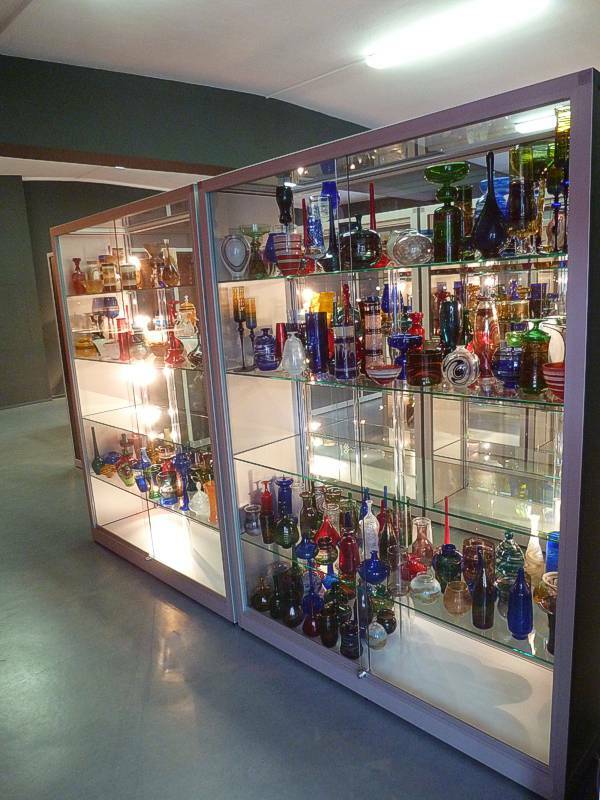 The museum collects, documents, researches and presents the Thuringian glass in its entire temporal and thematic range: from the late Middle Ages to the present. 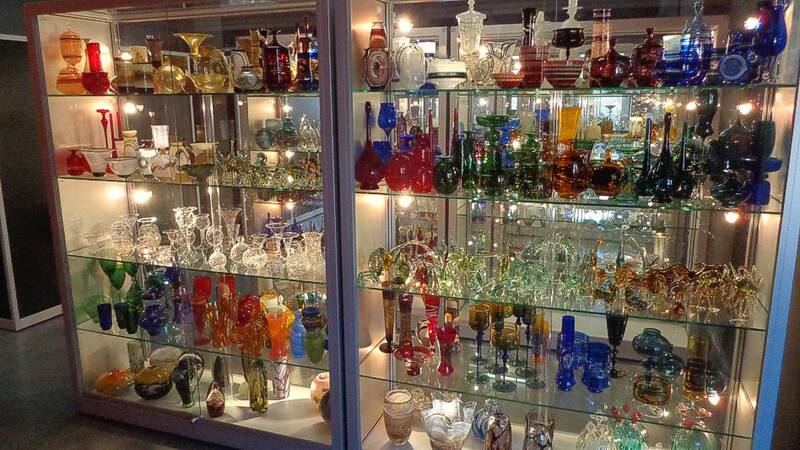 From early forest glass to burgeois pots, glass beads, glass eyes, toys and technical glass to the art of craftsmanship and glass art of the present. 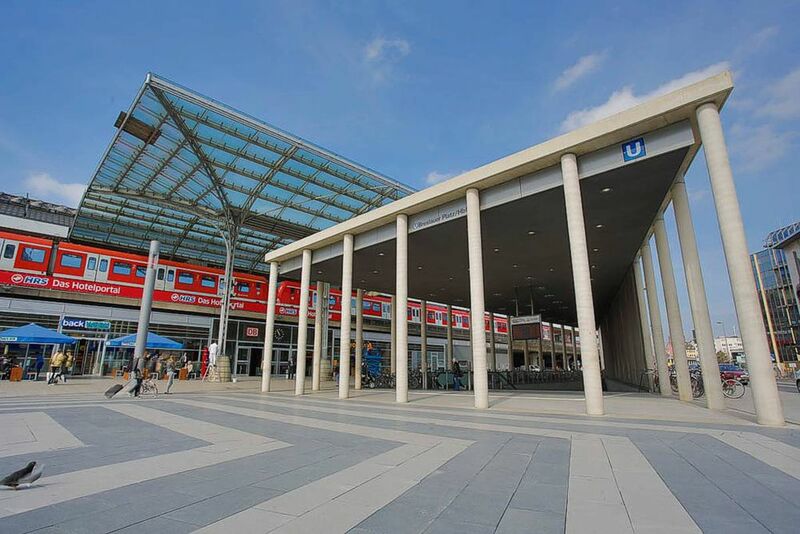 Six exhibition rooms and a special exhibition area of about 300 square meters await you! 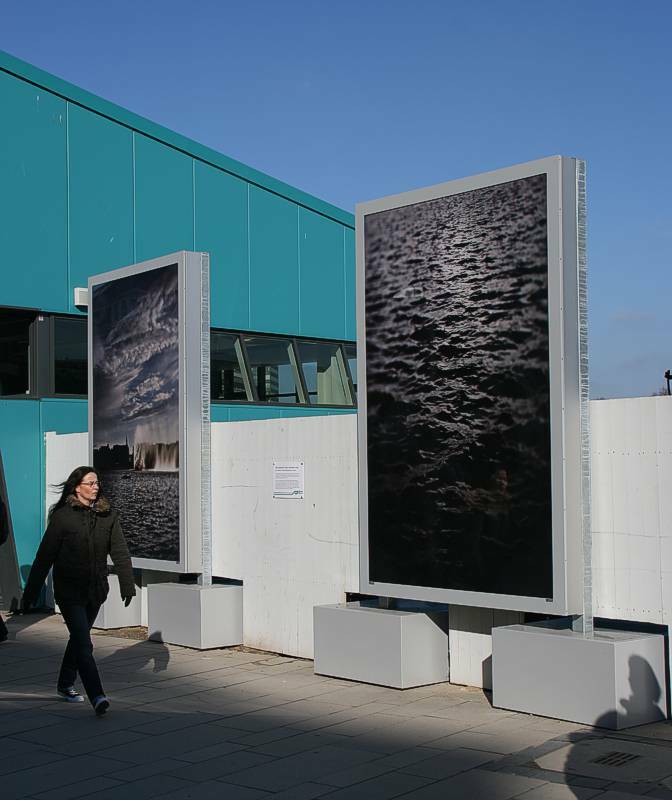 The German island Sylt has redesigned its pedestrian zone in Westerland. 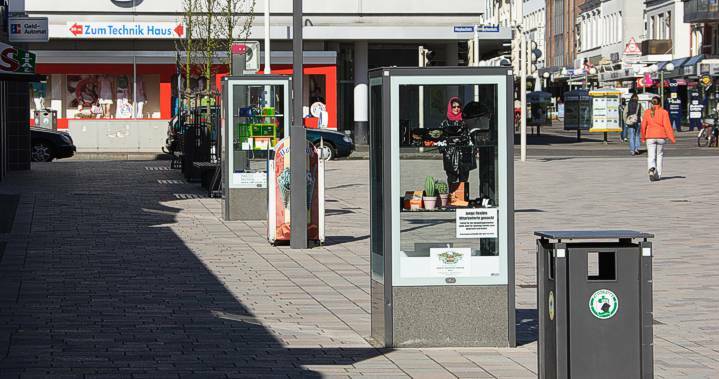 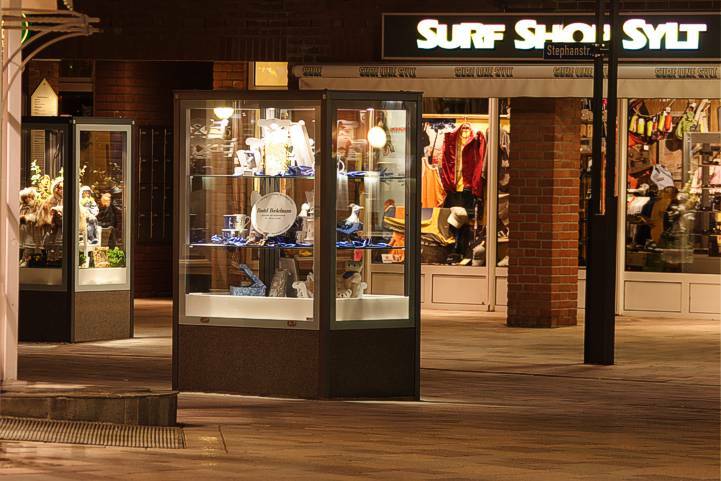 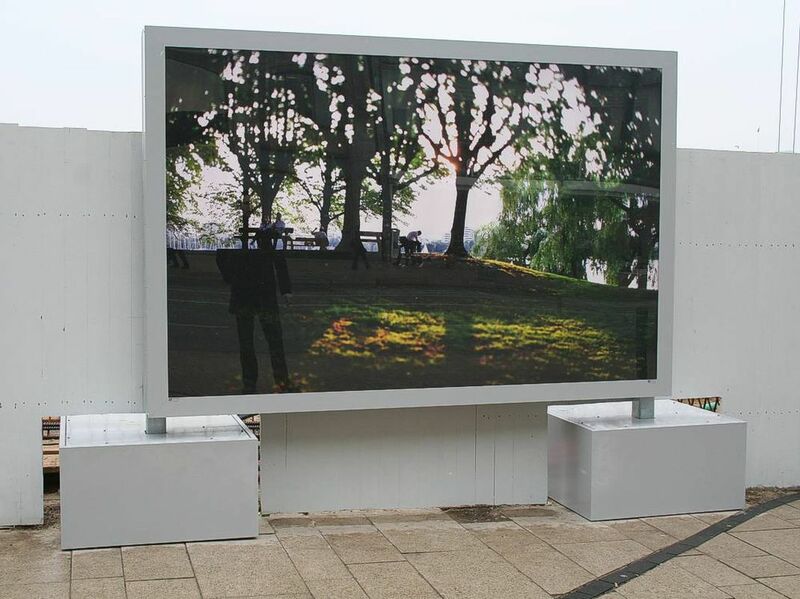 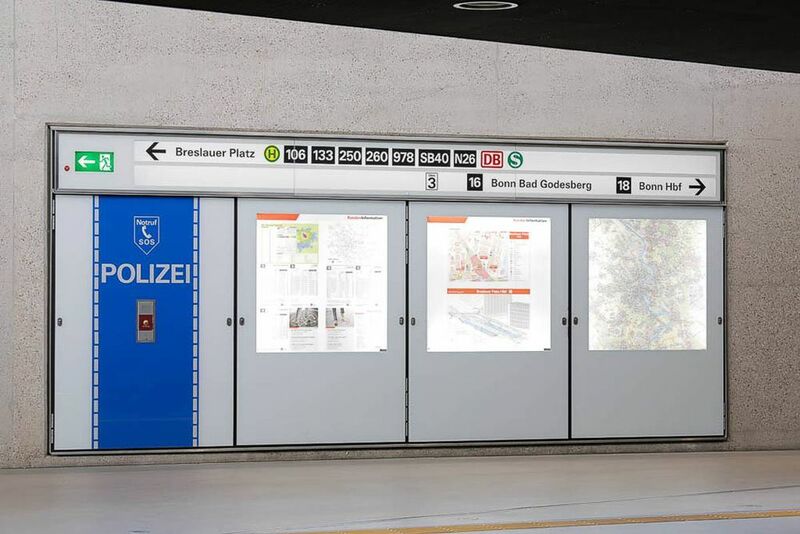 More than 40 ST-BOULEVARD showcases have been placed in front of individual retail outlets and form a versatile solution for the presentation of objects and information in the public space. 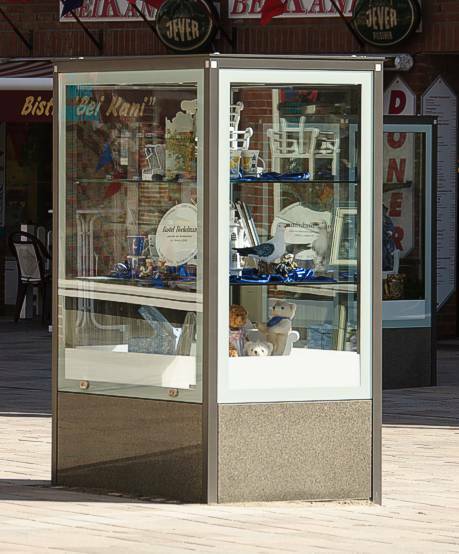 The showcases were produced in the VITRUM® system from a preconfigured aluminum profile system with flush-mounted glass and granite stone. 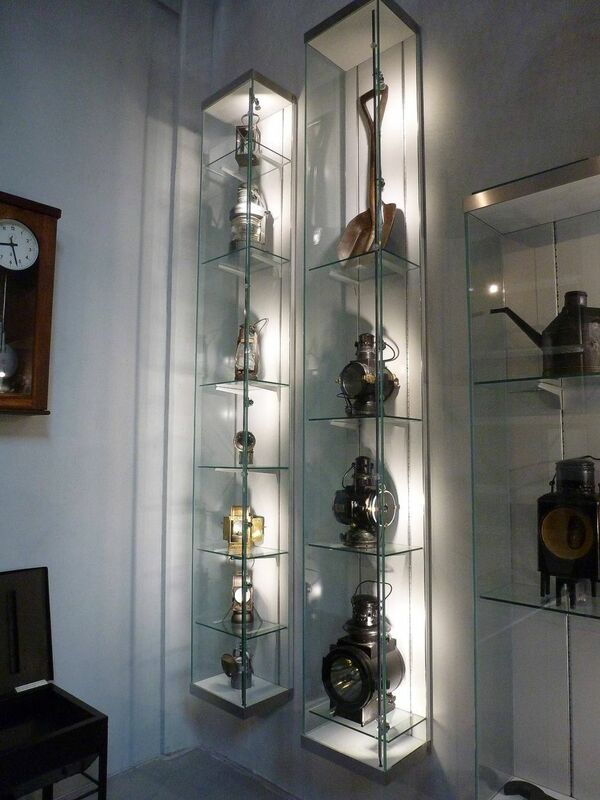 The glass shelves are adjustable and illuminated with 4 stainless steel low-voltage halogen lamps. 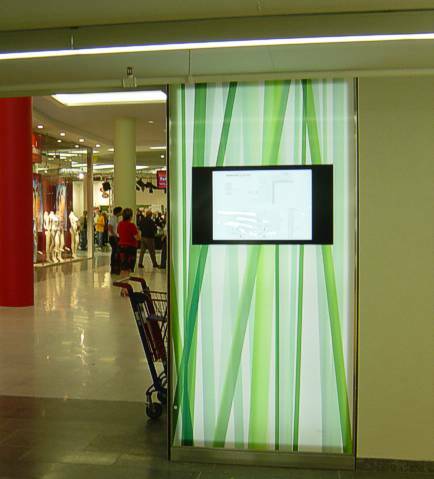 In the interior, a specially developed ventilation and heating system is integrated which prevents the showcase from being fogged.